I’m continuing with my Travelling in the 90s series today… Excerpts from my travel journal kept during my 1993-1994 grand adventure in Europe and the UK. 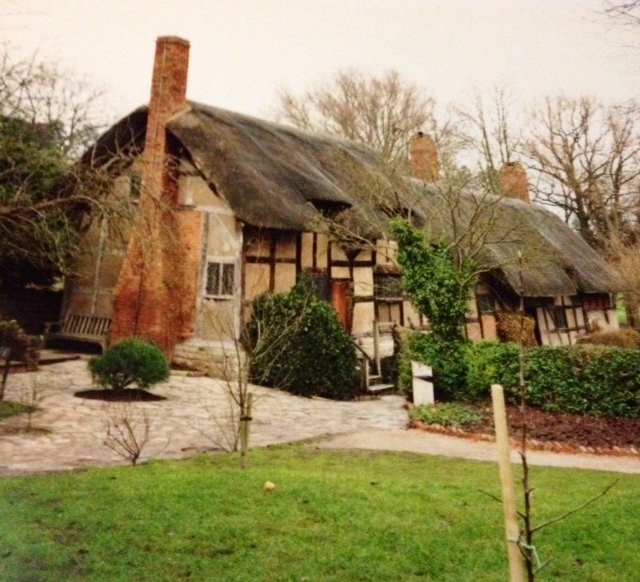 [Sunday 9 January, 1994] Yesterday we went back to Stratford-upon-Avon, where we met up with another of our friends, M. We went to Anne Hathaway’s house first – it’s set in a lovely garden complete with orchard. There was also a recently planted tree-garden containing trees mentioned in Shakespeare’s plays. I loved AH’s house, but the pick for me was Mary Arden’s house — primarily because of the falconry display. They fly birds of prey all day (weather permitting, and thank God it did) and the minute we got there I bolted down to see. 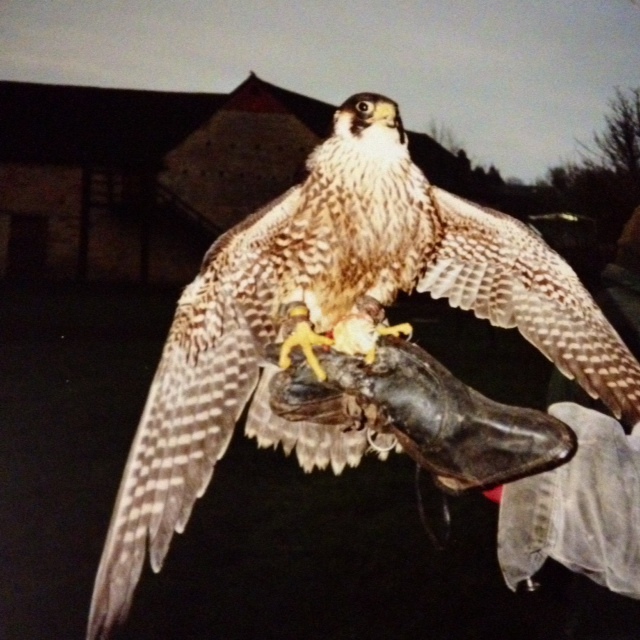 Lucky I did too, because a man was flying Henry the peregrine falcon. I nearly died (or wept with joy). He was using a lure to tempt Henry, and the poor bird flew around quite a few times before he finally grabbed it. I could get really close for a photo too. We watched Henry tear ruthlessly into a baby chicken (dead of course) while we talked to the guy who flew him. He said they flew all the birds each day, and that two were out hunting that day. (They actually take people out falconing for 40 pounds a day!) Apparently peregrines are not the easiest birds to hunt with, as they require large open spaces (expensive to hire) and sometimes take their prey a long way so it’s hard to catch them. The idea is to ride with the bird, so you can steal its prey before it’s eaten. You also need pointers to find the birds (grouse for example) and flush them out. Also, peregrines don’t always come back! Hawks are far more reliable. After this ever so interesting chat, we watched a woman fly an eastern eagle owl for a while, before deciding our toes were too cold and we needed warmth. Mary Arden’s home itself was also interesting. The tour included all sorts of anecdotes such as the origin of “turning the tables” which derives from the fact that a table top was reversible — the rough side was used for eating, then was flipped so that all the mice and rats could clean up the remains. Also “upper crust” because the most important people got the top of the loaf of bread. 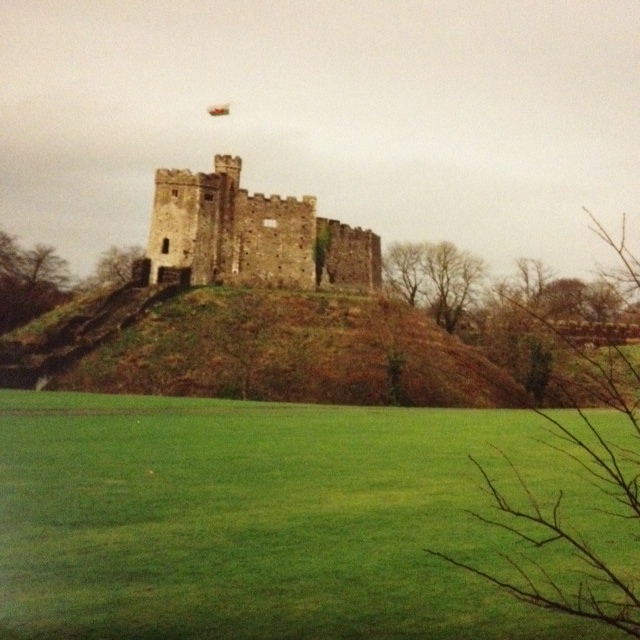 [Monday 10 January, 1994] Sunday, we three headed to Wales. We spent the afternoon in Chepstow, seeing the castle which was rather large and impressive with 5 separate defensible sections. It also featured an interesting video on the use of siege engines and an exhibition dealing with the Civil War in England started by Oliver Cromwell. We arrived at our destination – a dairy farm in St Fagans (near Cardiff) belonging to family friends – in time for dinner. 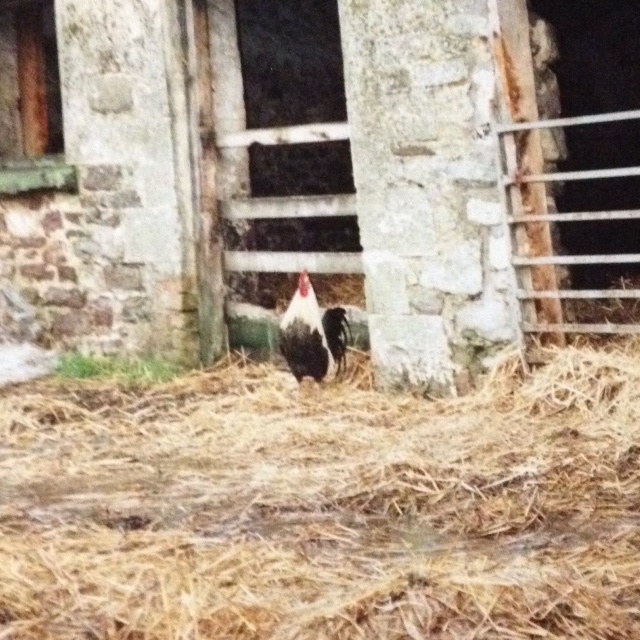 Today a promising beginning (early morning farm stroll) turned a little sour when I was attacked by the farm cockerel, Ceiliog. I was saying hello to the horse when Ceiliog (who happens to be a game cockerel) decided to launch himself at my shins, tearing my pants and drawing blood! Pain! I wasn’t too impressed (need I say) and everyone else just laughed. (I wasn’t too impressed with that either!) Anyway, it’s now covered in elastoplast and doesn’t hurt unless I knock it. We then heard the story of Ceiliog who has recently lost(?) his mate and second generation children, and has been deposed by his first generation children who’ve given him the cold shoulder. Now I feel sorry for the poor bird. We went into Cardiff and wandered around for a while — seeing the highly decorative public buildings and civic centre — before going to see Cardiff Castle, which was very interesting. It has a Roman wall and a Norman keep and a Victorian (?) palace built by a man who was then one of the richest men in the world. We didn’t see the inside but apparently it’s very elaborate. There was also a Welsh army regiment exhibition which was mildly interesting for H and I, but exceedingly so for M, who is keenly interested in all things military. The Welsh Folk Museum (where we went next) was excellent. The inside exhibition occupies a modern building and shows historical articles of daily life (laundry, house cleaning, education, sport, music etc). However, outside is an extensive village — full of reconstructed farmhouses, shops, craftsmen’s workshops, and even a “castle” or old manor house. They even had a toll gate and toll house. I wish we’d had more time to spend there. 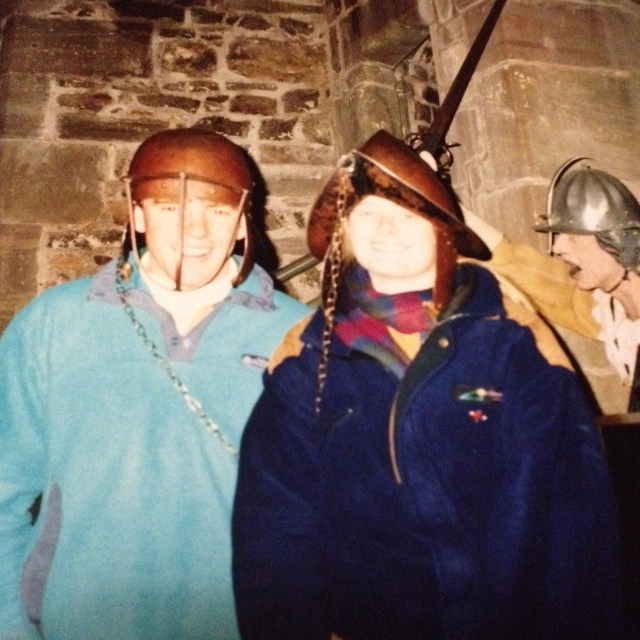 [Thursday 13 January, 1994] Tuesday morning we set off for the national mark of the Brecon Beacons. Our route took us from Merthyr Tydful through a green valley of reservoirs towards Brecon. We detoured up to the mountain lodge — a sort of tourist centre for the region. It was drizzling slightly, but we went for a short walk anyway, with rain coats, scarves and gloves on. Our destination was a Roman road, but we also just wanted to get out and walk around some of Wales. Well, the drizzle worsened dramatically into a vicious downpour and gale-force winds — FREEZING! In all, it was rather a memorable experience; however, we got soaked, and I mean really wet! I’m still not really sure what exactly the Brecon Beacons are, but we did find the ruins of a Roman road. We surged back into the car — rosy cheeks and chattering teeth — and set course for the nearest pub. Our selection criteria were steak pie (as close to an Aussie meat pie as you can get in the UK) and open fire. We were successful in neither of these (! ), but found a pub called “The Wheat Sheaf” where we ate lasagna and chips and coffee. By the time we came out (1.5 hours later) it had stopped raining. We drove then towards Hay on Wye, passing a fair dinkum toll gate (Whitney on Wye). Thrilling!!! For 50p we had the gate opened for us by a man sitting in his little toll house. It totally made my day. So did Hay on Wye. It’s a town of a million second-hand bookshops. (Well more than twenty-five anyway.) Unfortunately (or perhaps fortunately for our backpacks) we only spent an hour, managing to find a shop that specialised in Sci-Fi Fantasy. Even an old cinema has been converted into a bookshop. An hour was definitely not long enough. Thus ends a nice little jaunt into Wales. The next installment will see us heading northwards. 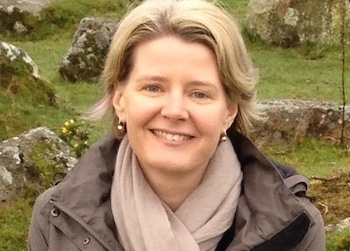 Oooh, Hadrian’s Wall… Edinburgh! Can’t wait! Thanks for sharing the memories! Also, I’m going to have “Linger” stuck in my head all day now. HAHA! Happy travels! It’s one of those songs, isn’t it? Might need to play the whole CD! Thanks for reading. oh man, Linger. Haven’t heard that in yonks. Was definitely one of my favourite songs at the time. Thanks for the flashback.